The art and colouring is great. 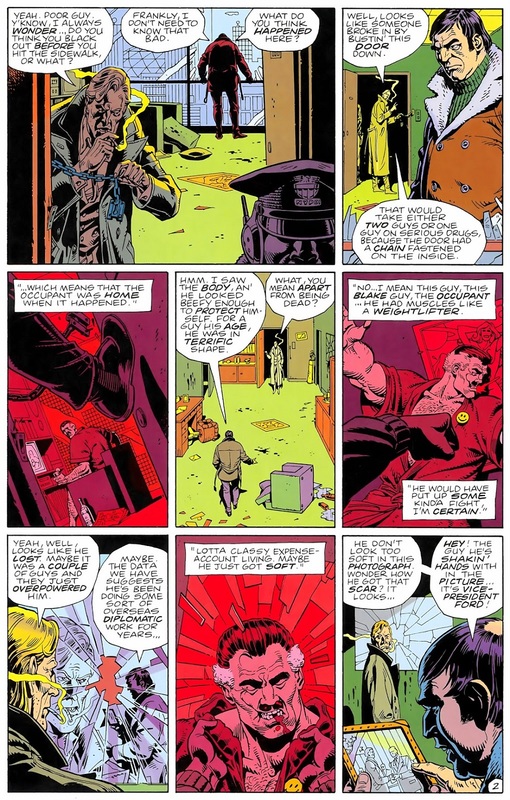 Detective Joe's feeling that a guy as muscular as Blake must've put up "some kind'a fight" reminds me of a comment locuatico made to the recent Doomsday Clock #2 post: "The Comedian had already given up by the time Veidt had come. 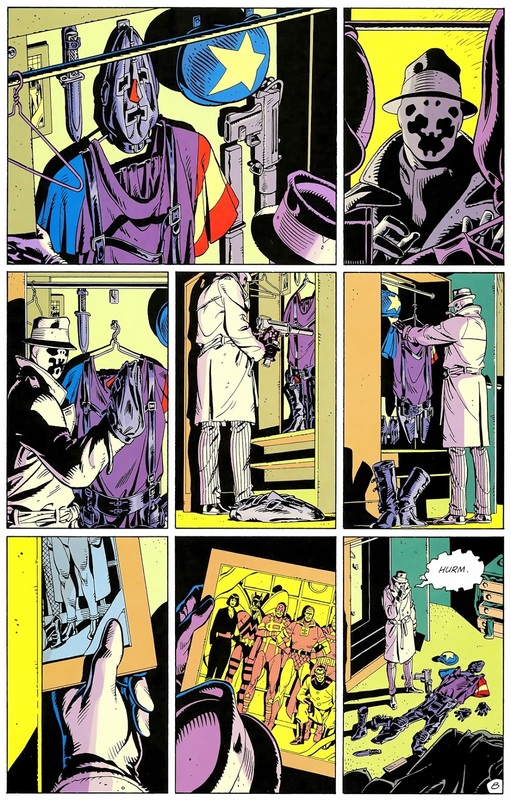 He was already broken from the discovery of Veidt's plan." That--and not, I think, merely the element of surprise, nor their differences in age--would explain how Veidt was so easily able to overpower a man who was still on active duty as a government mercenary. The Comedian just didn't have it in him, psychologically, to defend himself. Was Blake, perhaps, so broken that he may have welcomed his death when it came? 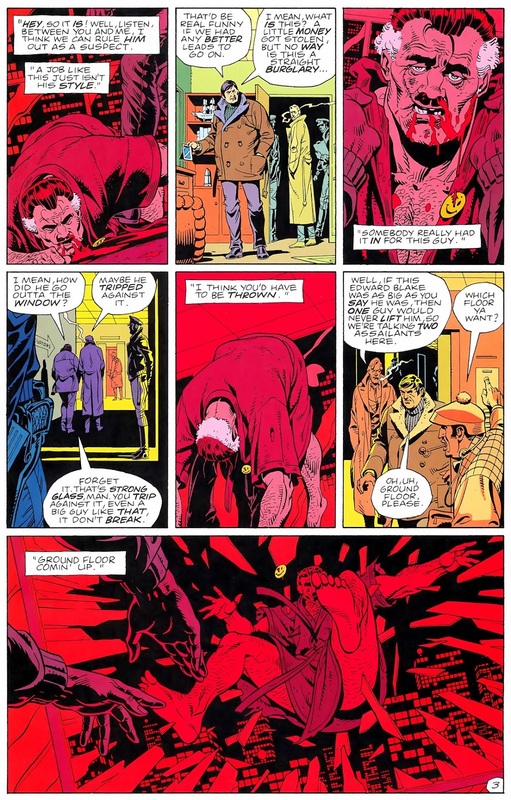 Not because he felt he deserved it--I hesitate to give him that much moral credit--but, maybe, because he felt he didn't want to live in a world where someone could do something as monstrous as Veidt's plan and get away with it? 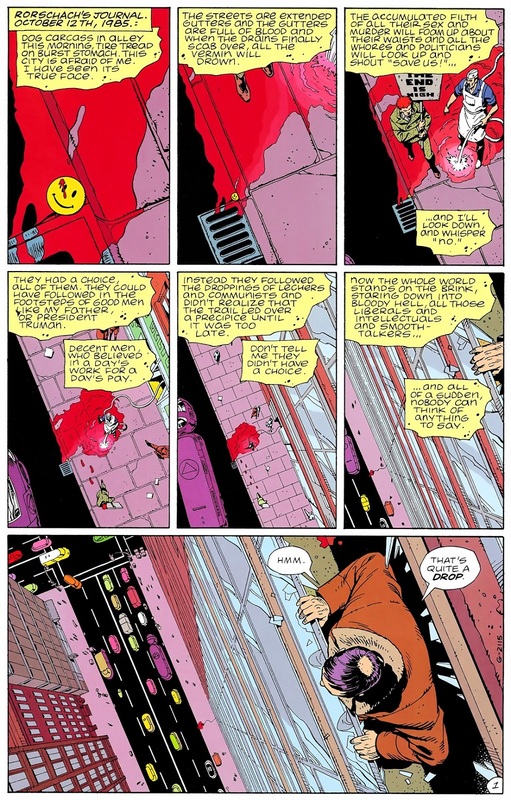 If so, his death would be a parallel of sorts to Rorschach's tearful acceptance, at the end, of death at Dr. Manhattan's hands--again, because he wouldn't let himself be part of Veidt's new world. The two deaths would then be bookends for the series. 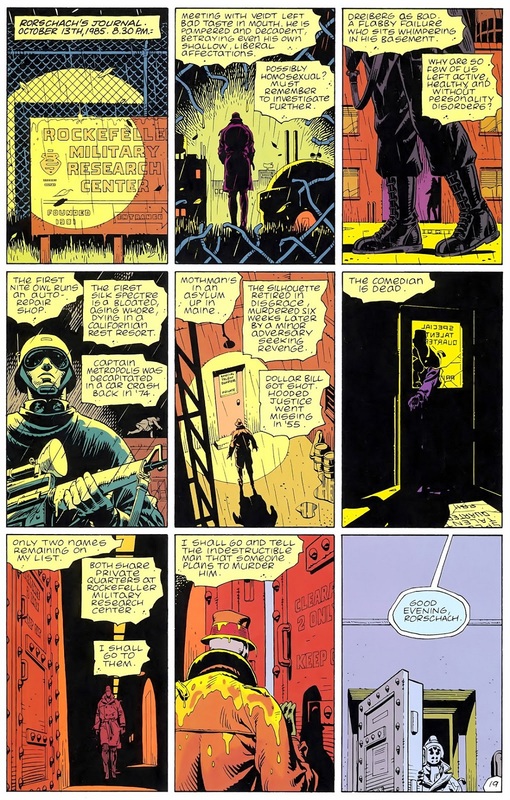 Watchmen, the gift that keeps on giving. The "live body and a dead body contain the same number of particles" line always bothered me. I get that it's intended to convey Jon's disconnect to humanity, but Jon is still obsessively scientific. And a scientist would not think that way. Scientists are generally interested in both function and structure. What does it do, and how does it do it? Even if live and dead bodies have the same structure (which they don't), their functions are radically different. That difference despite the supposed identity in structure would be hugely interesting to a scientist. To take a much lesser example, suppose you had two paper airplanes that appeared identical to all modes of measurement: same material, same shape, same weight, etc. Except when you threw them: one soars across the room while the other drops like a stone. That would be immensely interesting to a scientist and likely to anyone with even a little curiosity. As I type this, I'm mentally formulating the kinds of tests I'd want to run on my hypothetical airplanes. And that's just paper! I think that's really the point, though: the function *is* different and Jon is behaving as though it's not. His scientific curiosity is flat, his interest in other people is flat, his entire existence is flat. It's not until very late that he starts to think outside the (possibly depressed) box he's put himself into and go beyond it. "Stolen psychological reports indicated his mental withdrawal." 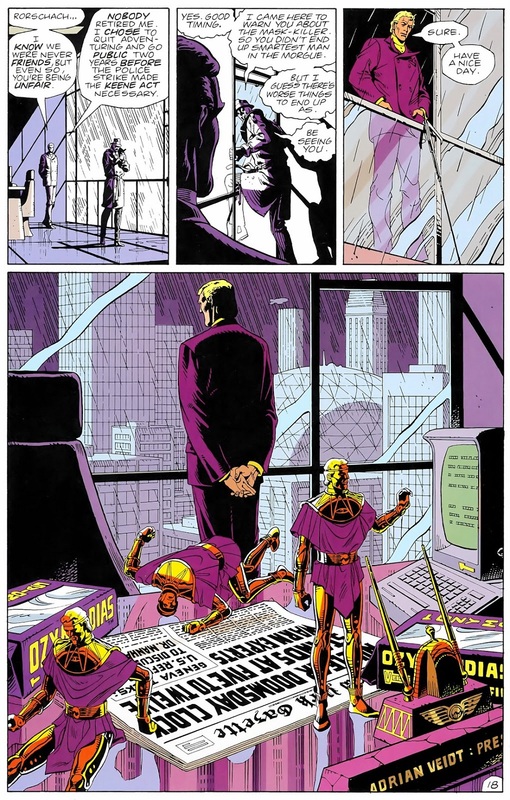 (Veidt, Issue #11) Yeah, I think depression's as good a guess as any. But he's still running experiments, in this very scene. And it's his interest in those experiments (and others in one notable future scene) that cause him to pay less attention to humans. The implication is that his scientific curiosity is eclipsing his humanity, not that he has no scientific curiosity. In other words, he's being characterized as the typical 80s "brainiac" who can't understand the human element. Not as a person in the midst of a depression. That's a cultural lens that didn't exist at the time this was written. I'd debate that - you can go back to Churchill's black dog for a cultural lens on depression. 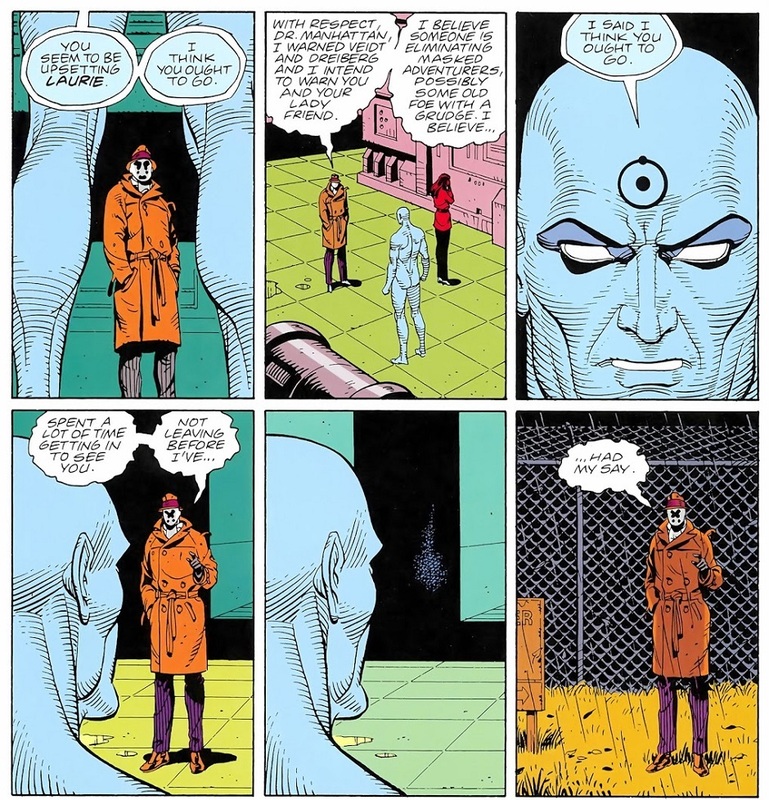 And for all the importance of these experiments, we never see what they are or what he does with them, unlike his earlier work as a human or soon after he comes back as Doctor Manhattan, or his later work as he goes into space. Agree people knew about depression in the 80s, but it is a mistake to assume that knowledge was the same as today. Back in the 80s, depression was considered a mental illness with all the stigma that implied then, not the treatable and relatable condition it is now. The "flatness" you describe was not popularly known-- almost everyone thought depressed people were just really sad. And I say this having dated someone in the early *90s* with diagnosed depression, and being completely unable to convey an understanding of her mental state to just about everyone. 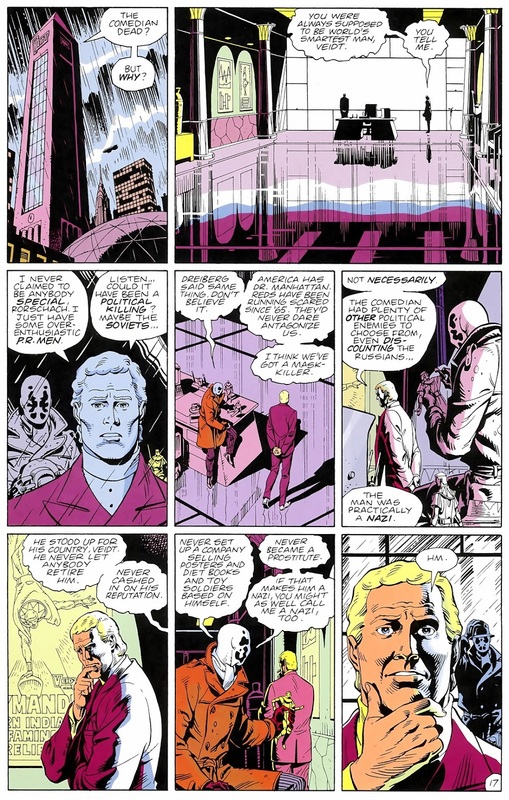 Maaaaaybe you can apply today's understanding of depression to these scenes, though IMO it doesn't work given how *involved* he is in those experiments. (A depressed person would not be nearly so enraptured.) But it's a mistake to use that modern understanding now. I might also add that the "smart people are stupid" characterization was way, way more common in the 80s than it was after the dotcom boom of the 90s. I vividly remember that, too. I think we're about the same age! 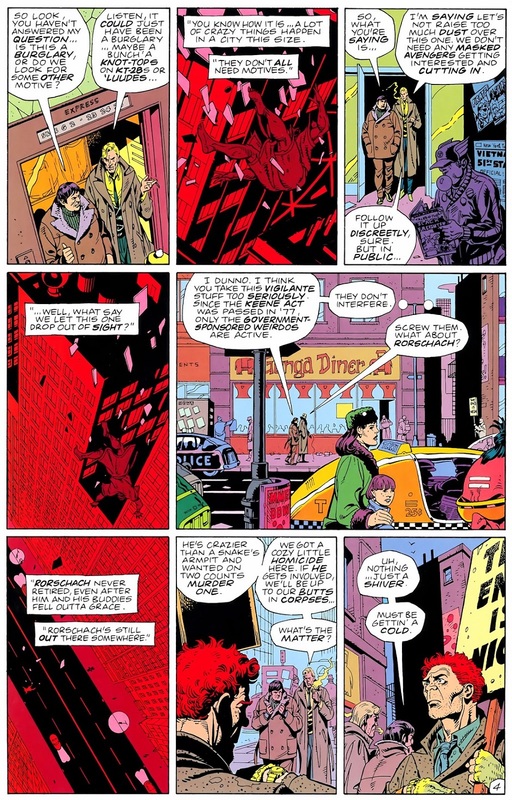 I agree that it's not the same idea as it is today, more catastrophic, and I don't think Alan Moore was going for "depression" as a concept at all, but that doesn't mean that the detached, uninterested characterisation isn't there. Definitely agree on the "dumb nerds who only know about science lol" from the 80s, before the dotcom boom, was very common, having been one of those nerds. But that’s a real thing, too. (Stereotypes generally come from somewhere.) In my personal experience, it describes easily half the graduate department of computer science at Rutgers University, now or at any time in the program’s existence. Some, if not most, of those people would be diagnosed today with Asperger’s syndrome, not depression. People with Asperger’s are known for showing intense interest in one area and lack of curiosity in others, even within the broader realm of science. 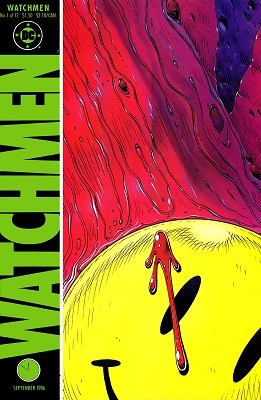 Dr. Manhattan was a physicist, wasn’t he? I always felt like this scene was sort of “It’s not of interest from a particle physics perspective, therefore it’s not of interest,” dismissal, and that it wasn’t too far off from real life. My birthday. 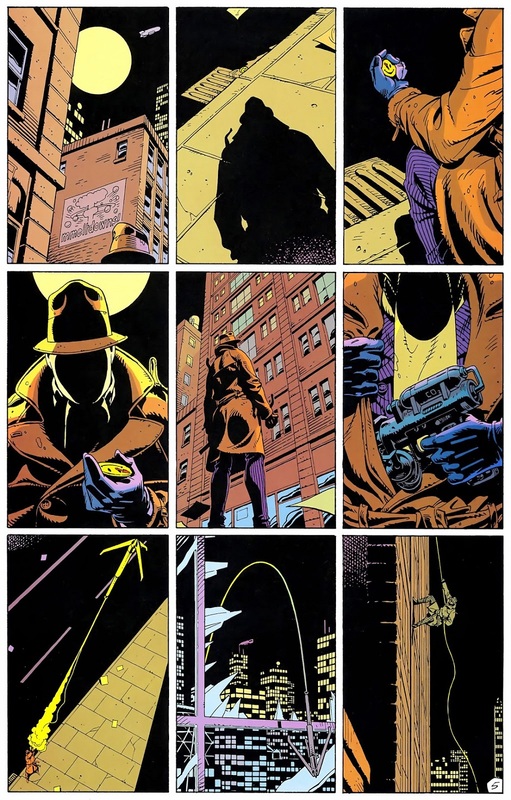 Damn, I love Watchmen.